Many wedding experts would recommend starting your wedding dress hunt nine months to a year prior to your wedding date. This will give you plenty of time to think, search around, try on as many bridal styles as you’d like and avoid rushing yourself into the stress of uncalculated last-minute decisions. 2. Refine your taste through wedding dress research. Before you start hopping through bridal boutiques, familiarize yourself with basic wedding dress shapes, fabrics and styles through online research in order to get a taste of what you truly like and be able to pinpoint the main characteristics you’d want to be present in your wedding gown. Save your favorite bridal looks in a separate folder for reference and inspiration. But make sure to not stick to one specific wedding dress just through this research! 3. Do not get too caught up in the latest bridal trends. It is good to be up to date on the latest wedding dress trends in bridal fashion but this does not mean you should pick from these trends specifically. Instead, go for something that you feel represents you as a person and reflects your individual style with timeless flair, as it is such individuality that will help you stand out from the countless other brides of the season! 4. Schedule your bridal dress appointments wisely. Try scheduling your appointments on weekdays early in the day to benefit from the winning mix of full morning energy and less crowded showrooms. And if you don’t feel like sacrificing more than one weekday, plan out your appointments in a time-efficient way that would allow you to visit as many destinations as you want within the timeslot you are willing to dedicate. 5. Cut down on the crowd. You might think having too many opinions is your path to picking the right wedding dress but it turns out many bridal consultants would recommend limiting your accompanying crowd to just one or two people whom you really trust. At the end of day, no matter how many constructive opinions you are showered with, you get to have the final say! If a wedding dress looks just breathtaking but you also can’t move in it, then you might want to reconsider your choice. 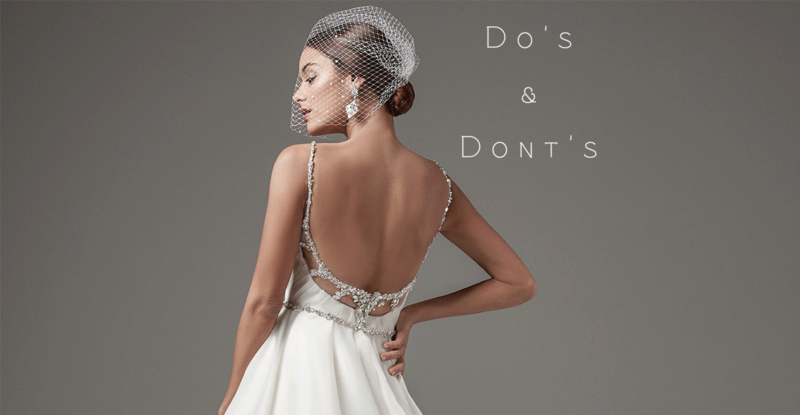 Remember that your gown should allow you to move freely and be comfortable in and be able to hold up peacefully through a long day that starts early in the morning and goes on way into the night. Think style, yes, but also think comfort! Finally, beware not to be rigid in your preset conceptions and expectations. If a wedding dress does not conform to your ideal prototype but seems cool to you, then nothing should hold you back from trying it on. Know your preferences but also be ready to experiment and take a little risk where needed. Stories from our Brides, who were dressed by Noiva’s Boutiques on their wedding day sharing with us their love story, from when they first met their significant other up until their wedding day!